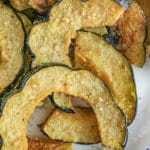 Oven Roasted Parmesan Acorn Squash is an easy five ingredient side dish that is seasoned with garlic and roasted to a golden brown with savory parmesan cheese. 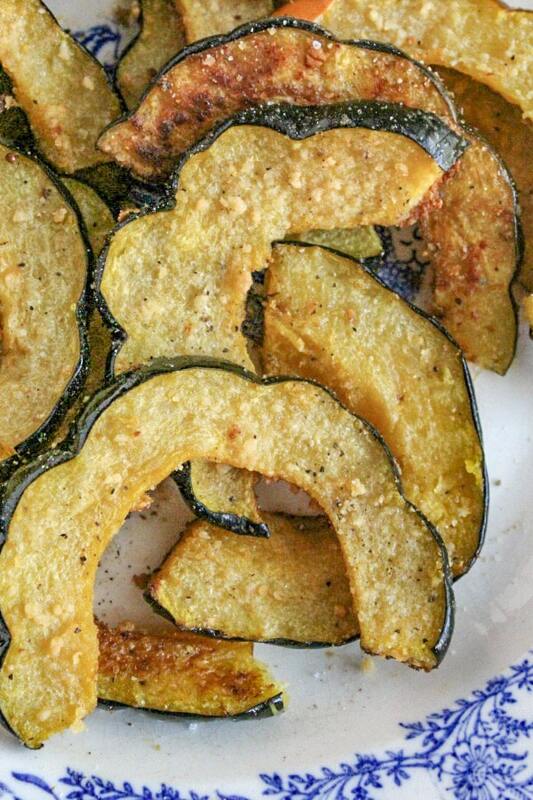 I love a good side dish, like this Oven Roasted Acorn Squash. I’m not kidding have a total of 25 side dish recipes on the blog. I’m not kidding. That little blurb under my picture on the right says I’ve tried recipes for everything from ambrosia to zucchini. What it doesn’t say is that a lot of those were for side dishes. If you’ve never cooked an acorn squash before if can be a little intimidating. I mean you’re probably looked at them in the store and thought what do I do this little hard thing? How do you even cook it? But don’t worry I’m going to show you what to do and you’ll be surprised how easy it is. Trust me. 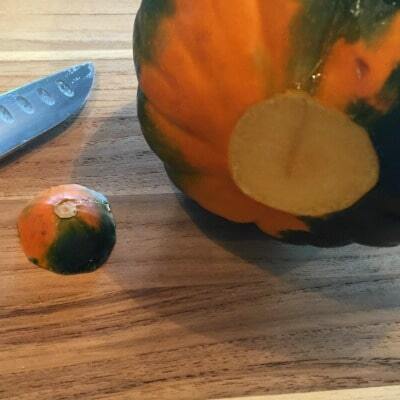 Look for a squash with a good balance of green and orange on the shell. As acorn squash matures it turns orange in color. A squash with a lot of orange will have a stringy flesh. The ideal squash will have a firm flesh on the inside. The outside of the squash should be smooth and firm. Avoid buying a squash that is rough to the touch or that has soft spots. Cutting an acorn squash can be a little tricky if you’ve never done it before so I’m sharing my tips for doing it easily below. Begin, by cutting the end and stem off the squash. Next, place the blade of the knife along the line between two ridges of the squash. It will take some strength to cut into the squash. Once you’ve made the first cut use that to work the knife around and through the squash to cut it in half lengthwise. Once you have worked the knife all the way around you might need to use your hands to pull the two halves apart. Once you have sliced the squash in half use a spoon to scrape out the seeds and pulp and discard. Then, for this recipe, place the squash flesh side down on a cutting board and slice it into half inch pieces. 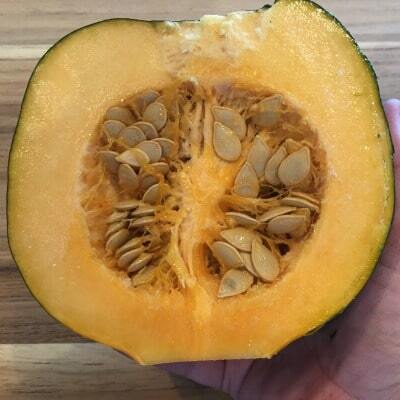 Now that you know what you’re looking for in the perfect acorn squash and the best way to cut into slices it time to get cooking. 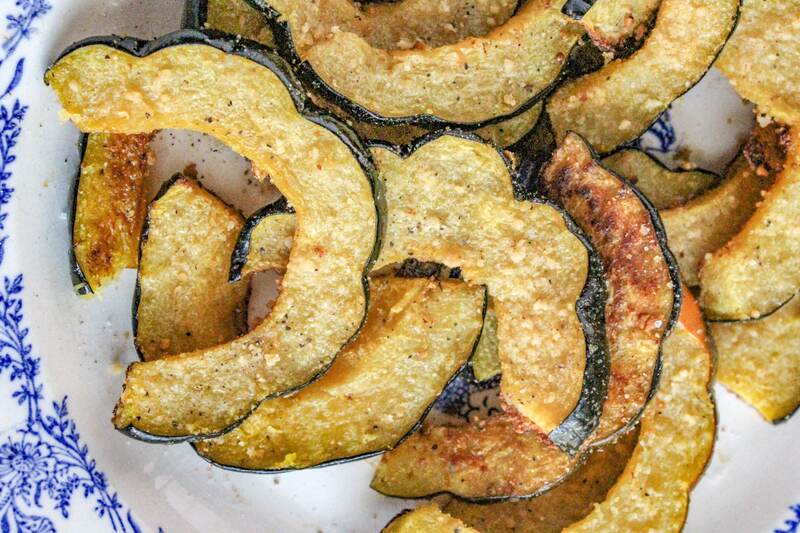 For this Oven Roasted Parmesan Acorn Squash you will need acorn squash, olive oil, garlic, parmesan cheese, salt and pepper. Cut the squash in half (see my tips below) and scoop out the seeds and pulp. Then slice it into half inch pieces. Then in a large bowl combine olive oil, garlic, salt and pepper. Toss the squash in the mixture to coat. Next, lay the squash out on a rimmed sheet pan. Then sprinkle with grated cheese. Place in a preheated 400º for thirty minutes or until the squash is fork tender and the cheese is golden brown. We really are HUGE fans of this recipe. It’s so good I even served it at Thanksgiving last year. I hope you’ll give it a try and that your family will love it too! This is a great recipe! Perfect for the fall! This an amazing recipe! Such a delicious way to enjoy squash. I love that you pair Parmesan cheese with it. Yum! 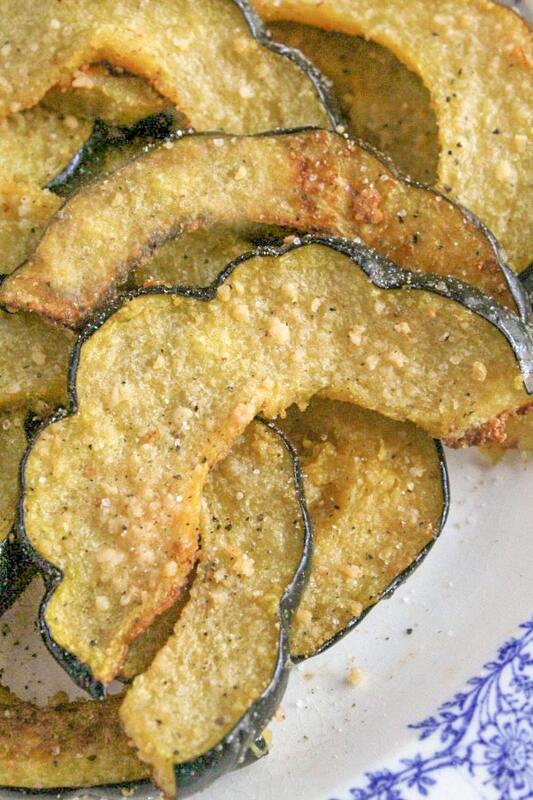 I’m a huge fan of acorn squash, and your delicious recipe is a must-have for any recipe box! It’s perfect for the fall season and as a healthy Thanksgiving side dish. 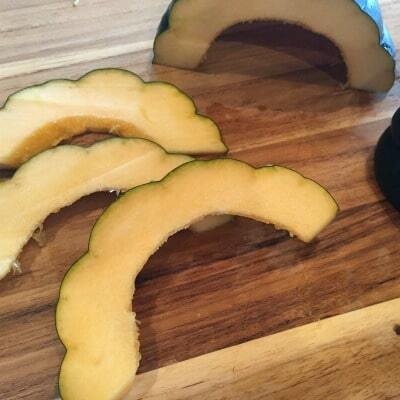 Do you eat the outer skin (the green part) of acorn squash after preparing it this way? I can’t wait to try this! I love acorn squash, to have a new way to prepare it makes me very happy. Thanks for such a great recipe.